What's Beyond Forks? 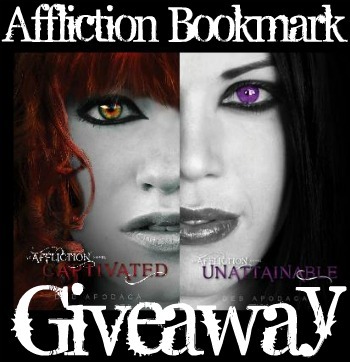 : Affliction Bookmark Giveaway! I had a lovely little surprise in my email the other day. D. Apodaca, author of The Affliction Series, sent me a message that she was sending me some Captivated and Unattainable bookmarks! Isn't she the sweetest? Not only that, but they are all signed! She sent me 5 sets of 2. I'll be giving away 4 sets. (I'm keeping one set for myself. Can you blame me?) How would you like to win a set? Thank you so much for the giveaway! I love swag and those are some lovely covers! I've been meaning to pick up book 1 for a while now! I'll have to do that soon! I've heard great things!! Thanks so much for the giveaway, this looks like an awesome read! Thanks for the giveaway=) Love your blog....I am glad i stumbled upon it! Hey!! I actually followed you over from Book Blogs to support you in following your blog. I'm your new GFC, Linky, Twitter and FB follower! YAY!! I hope you'll stop by my newly revamped blog and follow me down that yellowbrick road, too. I'm a new BookBlogs Member. You have a great blogsite. Lots of fun and good reviews. Thank you so much for the Giveaway!! I love the covers of these book!!! I just read Captivated a few months ago and loved it! I'm going to have to write a review soon =) Thanks for the giveaway, I'm always in need of a bookmarks nowadays! Already read Captivated and can't wait to read unattainable. thanks for the giveaway. Captivated was awesome!! ooh....i'm lovin' those covers...looks like a good read!